When you start something, you always know that there will be an expiration date on what you started. One way or another, the end will come, and you will move on from your journey. This summer, I have spent a lot of time moving on from the journey of forming an organization, and the day to day running of that organization. Moving on has been its own journey of sorts. But the over all consensus for me, and my family, is this: moving on was exactly what we needed. Beyond- at or to the further side of. "he pointed beyond the trees." 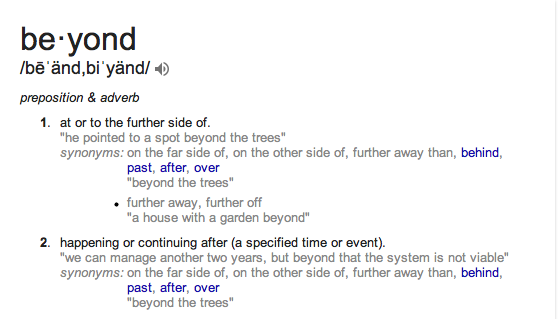 Beyond- happening or continuing after (a specified time or event). For me, what is behind me is advocacy. Oh yes, in some ways I will continue. I will share my daughter's photo on my page. That is one of the most powerful forms of advocacy. 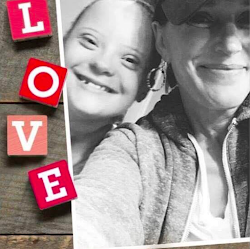 I might ask you to read an article, or report something that is unfair or unkind being directed at people who have Down syndrome. I call that advocacy light. Where you share what large advocacy groups ask you to share. That I will continue to do. With a happy heart, I am no longer part of the day to day advocacy. It is behind me now. I have peace in this decision. I am very proud to have been a part of something so wonderful, and even more proud to hand it off to others who have the energy and the passion to continue it. I am now beyond. Beyond advocacy. I have started a little group, for those who were part of my life, who would like to stay in touch with me. I got close to a lot of people over the years, and loved meeting so many families who welcomed me into their journey. This group will not be an advocacy group. It will simply be a place that anyone can join who has enjoyed being a part of my journey. It is a place where I will share laughter and stories, and the good things that go on in my life, now that I am beyond advocacy. If you are interested in joining that group to stay in touch with me, you can find it at Diane Grover- Beyond Advocacy.